The Vikings returned to the team competition of the DIAA State High School Golf Championship, held May 27-28 at Maple Dale Country Club in Dover, and finished in ninth place. Cape’s last appearance in the state championships was three years ago, but you have to go back to a 7th place finish in the 2007 tournament for a better Cape result than this year’s performance. Mason Jones posted an 89 the first day, and improved that score by seven strokes in his second round. “I had lots of bogeys and lots of pars,” he said. Baptiste also earned a medal as the best (and only) female golfer to finish the championship. 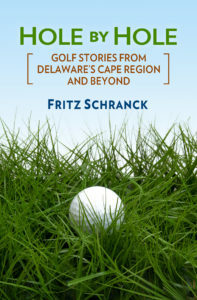 This year’s tournament also featured several changes in the format, according to Bill Barrow of the Delaware State Golf Association. In years past, all state high school varsity teams qualified for the championship. More recently the team competition was limited to the top sixteen schools in the state, joined by individual golfers from the schools whose teams did not qualify. The best four scorers for each team from the first day would then play the second round. This year’s format shrunk the team competition to only ten teams, while increasing the number of players competing in the individual category. Conrad High School managed to make it eleven teams, thanks to four players who qualified as individuals in the Blue Hen Conference tournament. In addition, the field for the second day was cut to the low 60 scores, regardless of how many players from a given school made the cut. Rachel Hagan and the Branner twins missed the cut, but DeStasio, Jones, and Baptiste filled the new three-player minimum to remain in the team event. Here’s how the teams finished: Salesianum (526); Archmere (550); Tower Hill (555); Caesar Rodney (560); Tatnall (563); Caravel (581); Charter (590); Sussex Tech (615); Cape Henlopen (625); Appoquinimink (637); and Conrad (658). The First Tee of Delaware is holding a training session for Cape Region golfers who would like to give something back to the game they love. The training will begin at The Rookery South on Monday, June 2, beginning at 8:30 a.m., and should last about two and a half hours. The First Tee is part of a national non-profit organization, supported by the PGA, the United States Golf Association, and thousands of golfers. The program aims at instilling valuable life skills in the youngsters who participate in the First Tee activities, while they also learn to play golf. As most golfers know, this game can develop character, while also revealing it. Contact Rookery head golf pro Butch Holtzclaw at 302-684-3000 to register for the session. In connection with this worthwhile cause, the First Tee of Delaware held its inaugural fundraiser golf tournament at Rehoboth Beach Country Club on May 19. According to PGA pro Scott Allen, the tournament ran smoothly. “Hopefully, this can be the start of something bigger in the future,” Allen noted. John Ray of the new Delaware Golf Trail (more about that in a later column) and Ron Casson, director of the Delaware State University’s Economic Development Center, were the winners. The Rehoboth Beach Country Club 18 Hole Ladies group held their opening day event May 21, with team winners selected in both gross and net formats. Elise Coar, Pris Desena, and Linda Tigani won low net with their combined 58, while Trish Medd, Pauline Porter, Barb Morgan, and Doris Rogers posted a 61 for second low net. Barbara Collins, Eileen Clark, Iris Mensch, and Jeannie Lindsay posted a 63 net for third place. The team of Debbie Schell, Gayle Truitt, Barbara Bullock, and Diane Strickler finished in fourth net, one stroke back. Perry Drevo, Gigi Lank, and Carol Wetherhold finished in first place in the gross category, teaming up for a 71. Carole Ann Medd, Connie Kotula, Kathy Curry, and Christine Moore finished in second place gross with their 74. The Kings Creek Country Club Ladies 18 hole Golf League played a 2, 2, 1 team format on May 22. Linda Outlaw, Atom Irwin, Jennifer Falcone, and Cory Warther took first place honors. Second place went to the team of Vicki Tull, Faye Slatcher, Rita Musi, and Nancy Froome. Warther also won the closest to the pin contest on the eighth hole, with a shot that finished three feet eleven inches from an ace. The Cape Henlopen High School golf team tied with Delmar High School for fourth place in the May 21 Henlopen Conference tournament, held at Sussex Pines Country Club. Viking golfer Rachel Hagen posted the lowest conference female score with her 99.